Friendship Tails: Welcome to Friendship Tails! 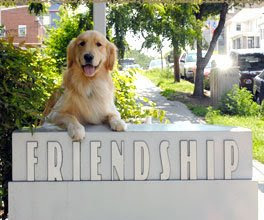 Friendship Tails is a blog about Friendship Hospital for Animals, a full-service veterinary hospital located in Washington, DC. Working at Friendship is amazing and I cannot imagine practicing anywhere else. After graduating from University of Florida College of Veterinary Medicine I was thrilled to be accepted in Friendship’s internship program. Friendship is one of the few hospitals in the area to offer this elective program intended to provide new graduates with experience and mentorship. After completing the internship I was lucky enough to be offered a position as a staff veterinarian. My duties at the hospital include seeing wellness appointments, working emergency shifts and performing both elective and emergency surgeries. Before attending vet school I graduated from Vanderbilt University with a degree in mechanical engineering. It wasn’t until I was out of college for a few years that I realized becoming a veterinarian was the perfect career path for me. I spent the majority of my childhood and high school riding horses and at home I was always surrounded by our many dogs. I never truly understood the remarkable bond that one can have with a pet until I met my dog Westin, golden retriever mix. She has been my best friend since college after I found her as a puppy living on the streets in the Bahamas. My relationship with Westin has inspired me to become a veterinarian so that I can help others experience the unconditional love and fulfillment that a pet can bring to your life. I live in Northwest DC with my three dogs, Westin, Sparkle and Lilly and three cats, Vegas, Breaker and Furla. The kitties are rescues I met while working at the animal shelter in vet school. Sparkle is a rat terrier and is very talkative and feisty; she apparently has an opinion about everything. Lilly is a Chihuahua mix I found playing in train tracks on the side of a highway in Florida and is by far one of the cutest dogs I have ever met (I could be biased). Needless to say with this crew there is never a dull moment in my house. My goal in creating Friendship Tails is not only to inform the community about all the amazing things that happen at Friendship but to offer a source of reliable information for pet owners. Every doctor at Friendship is committed to providing the highest quality of medicine for their patients, the technicians work tirelessly to make sure everyone is given the best care possible and the front desk staff ensures everything runs smoothly. In addition to what we do at the hospital Friendship is also very active in the community with close ties to Washington Humane Society, Washington Animal Rescue League and DC Animal Control. Apart from what an exciting place Friendship is I also want to educate pet owners so that they can work with their veterinarian to ensure a long and healthy life for their own dogs and cats. I find that my clients often have the same questions and concerns regarding their pets medical needs, I hope Friendship Tails can answer some of these questions. I would be lost without the animals in my life; let me help you care for the pets in yours. I RECEIVED AN E-MAIL FROM YOUR DAD. I HAVE KNOWN HIM SINCE HIGH SCHOOL AND HAVE BEEN IN TOUCH FOR A FEW YEARS. I AM HAPPY TO BE ABLE TO HAVE THIS SITE TO ASK QUESTIONS.,I HAVE 3 GERIATRIC DOGS- 2 FRENCHIES AND A BASSET HOUND AND THEY ARE ALL OVER TEN YRS OLD. ONE HAS COPD AND A TUMOR ON HIS HEART. WE HAVE BEEN ABLE TO KEEP HIM GOING BY GIVING HIM VIAGRA, WATER PILLS,PREDNISONE, HEART AND LUNG MEDS. VERY EXPENSIVE NEEDLESS TO SAY. I'M LIKE YOU...LOVE MY BABIES. I ONLY WISH I WAS A VET SO I COULD GET THE MEDS WHOLESALE. I AM GOING TO PASS THIS ALONG TO SOME FRIENDS WHO LIVE IN BETHSEDA AND FAIRFAX. IT WAS NICE MEETING YOU AND YOU LOOK LIKE YOUR DADDY! PS: MAKE SURE YOU TELL YOUR FATHER I EMAILED YOU. DON'T YOU LOVE NETWORKING? I TOO KNOW YOUR FATHER AND YOU ARE MUCH BETTER LOOKING THEN HE IS! WE HAVE A YELLOW LAB(9),BLACK AND CREAM SHORT HAIR DAUCHOUND(2) AND HIS 1/2 SISTER A LONG HAIRED ENGLISH CREAM DAUCHOUND(1). THEY ABSOLUTLY LOVE ONE ANOTHER. I TRULY BELIEVE THAT MORE IS BETTER WHEN IT COMES TO YOUR ANIMALS. THEY ARE SUCH GOOD COMPANY FOR EACH OTHER AND THEIR MASTERS. RECENTLY WE WERE IN THE BAHAMAS AND TOOK A TOUR BY THE LOCAL MAYOR-CAB DRIVER. I'M NOT KIDDING. ANYWAY, HE TOLD US ABOUT THE NEEM TREE THAT IS GROWN IN THE ABACOS AND SOLD THERE AND ON THE INTERNET. IT IS SOLD FOR HUMANS AND ANIMALS TO HELP WITH EVERYTHING FROM ARTHRITIS TO SKIN IMPROVEMENTS,HAIR GROWTH,ETC. I STARTED GIVING THIS TO OUR 9 YEAR OLD LAB THAT HAS ARTHRITIS AND SHE IS LIKE A PUPPY NOW. NO MORE LIMPING. SHE DASHES AROUND WITH HER LITTLE BROTHER AND SISTER LIKE SHE IS ONE OF THEM. I WILL BE WATCHING FOR FURTHER NEWS FROM FRIENDSHIP TAILS,THANK YOU, I THINK THIS IS A WONDERFUL IDEA.